T he world’s first service club, the Rotary Club of Chicago, was formed on 23 February 1905 by Paul P. Harris, an attorney who wished to capture in a professional club the same friendly spirit he had felt in the small towns of his youth. The Rotary name derived from the early practice of rotating meetings among members’ offices. Rotary’s popularity spread, and within a decade, clubs were chartered from San Francisco to New York to Winnipeg, Canada. By 1921, Rotary clubs had been formed on six continents. The organization adopted the Rotary International name a year later. As Rotary grew, its mission expanded beyond serving club members’ professional and social interests. Rotarians began pooling their resources and contributing their talents to help serve communities in need. The organization’s dedication to this ideal is best expressed in its motto: Service Above Self. 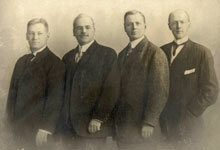 By July 1925, Rotary had grown to more than 2,000 clubs and an estimated 108,000 members. The organization’s distinguished reputation attracted presidents, prime ministers, and a host of other luminaries to its ranks — among them author Thomas Mann, diplomat Carlos P. Romulo, humanitarian Albert Schweitzer, and composer Jean Sibelius. “Few there are who do not recognize the good work which is done by Rotary clubs throughout the free world,” former Prime Minister Winston Churchill of Great Britain once declared. In 1989, the organization voted to admit women into clubs worldwide. Today, women are an integral part of Rotary’s membership.